Google merge Gmail, Drive and Google+ photos storage, whilst allowing all developers to respond to comments on the Play Store! Google's suite of email, online storage through Google Drive and Picasa or Google+ photos, depending on which you prefer, has been separated out and people have been awarded storage based on each service in turn. From today though, things will be changing. 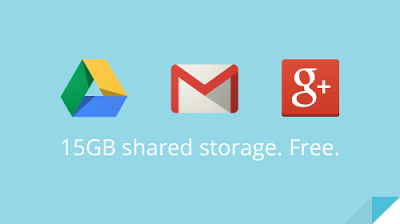 Google will now bundle the free 5GB of storage which comes with Google Drive together with the 10GB of storage which comes with Gmail, so that you'll have a total of 15GB of storage to divide up across the services however you fancy! If your 15GB of cross-storage proves to be too little then now you'll have to fork out a little more to extend your storage, as Google has dropped the plan which gave you 25GB of extra Google Drive space for $2.49 a month. Instead, your cheapest option is now 100GB for $4.99, whicnto be fair to Google is half of the price of the 100GB plan which Dropbox offer. Don't be alarmed if these changes haven't happened to you yet because they're rolling out over the next few weeks. One thing which definitely will be changing from today though is that all developers on Google Play will be allowed to respond directly to comments on their apps. There's not too much to add on this, but it should help developers eradicate spam comments and genuine issues should probably be a lot easier to resolve now! Google (1) and (2) Via TheVerge and Engadget respectfully.